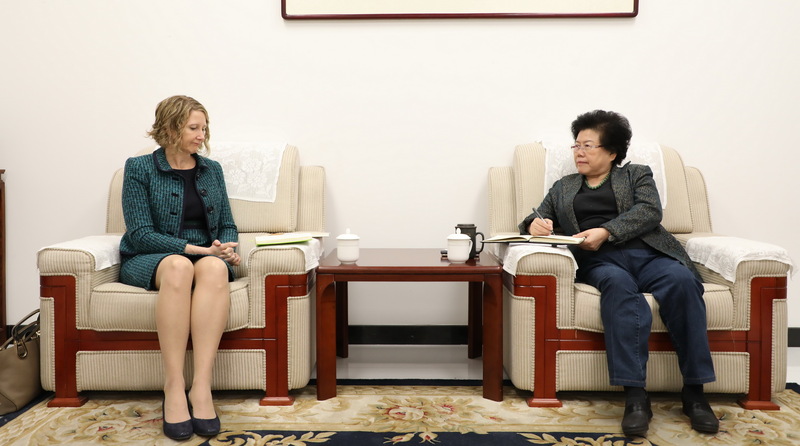 On May 11th, Chen Wenling, Chief Economist of CCIEE met with Elizabeth Peak, Economic Minister Counselor of the Australian Embassy in China. The two sides conducted in-depth exchanges on Sino-US trade frictions and Sino-Australian economic and trade relations. Ms Peak said that China and the United States are the two largest economies in the world and the stable Sino-US relations are crucial to the development of the global economy. China and Australia have complementary economic structures and China is an important trading partner of Australia. Australia supports the use of the WTO mechanism to resolve differences and opposes unilateralism and trade protectionism. Moreover, Australia is willing to actively strengthen communication and coordination of economic policies with China and seek common development. Chen Wenling said that Australia is an important trading partner of China and there is huge space for cooperation between the two countries. China values the efforts put by Australia to safeguard the multilateral trading system and all trade disputes should be solved through consultations under the WTO framework, unilateralism and trade protectionism are not conducive to the development of economic globalization. China is committed to building a common community of shared future for all mankind and will continue to adhere to the path of opening up, oppose unilateralism and seek common development with its partners. The two sides agreed to further strengthen exchanges and cooperation in the future.